In 2001, the Alberta Genealogical Society (AGS) began to create a comprehensive name index to the Alberta Homestead files. It consists of individuals who had applied and received grants of land under the Dominion Lands Act, along with those who abandoned their homestead, and others who were mentioned in the file. The following information highlights the advantages of using the online AGS Alberta Homestead Index over the database of the Library and Archives Canada (LAC) Land Grants of Western Canada, 1870-1930 › or the recent addition to the Ancestry website, Alberta, Canada, Homestead Records, 1870-1930 ›. 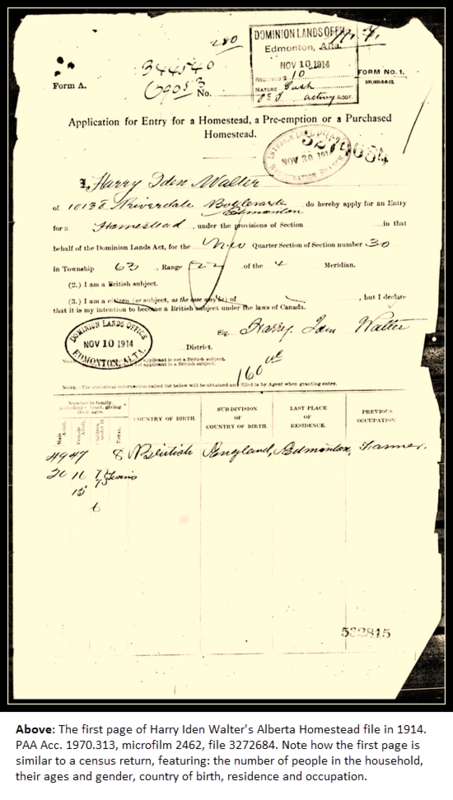 A search of the AGS Alberta Homestead Index gives results from three collections held at the Provincial Archives of Alberta (PAA) ›. These four-page applications for land patents exist only in paper format at the PAA; they are not digitized on Ancestry. The names are searchable on the LAC website through their Land Grants of Western Canada, 1870-1930 database only for those individuals who obtained title to land. Digital images of Letters Patent, a one-page document with the name of the grantee, a description of the homestead and the date when the land was granted maybe available on the same website. those who were beneficiaries of a deceased homesteader: for instance, the name of any person having some interest in the land. The Ancestry index to these records only shows the names of those who completed an Application for Entry for a Homestead, a Pre-Emption or a Purchased Homestead. The link produced from a search takes the researcher to the document completed by that homesteader. One is then able to scroll through the complete file. It is possible to find a name on the AGS website index which is not on the Ancestry index. Using the details listed, one can then locate the film on Ancestry then scroll through to locate the correct file. There are a few microfilms for homestead files missing in the Ancestry database but available at the PAA. If no information is found on Ancestry, check the AGS index for a film (reel) number. 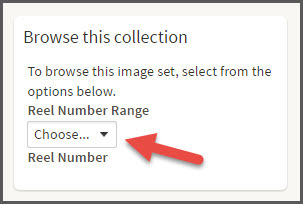 You can then return to the Ancestry drop down menu and browse for the film (reel) number. If the reel number is missing, copies of the homestead file can be ordered from AGS. The quality of print from microfilm is generally better than printouts from the Ancestry database. If satisfactory copies are not produced from Ancestry, they can be ordered from AGS. These names are searchable on the LAC website through the Land Grants of Western Canada, 1870-1930 database for only those who obtained title to the land. Digital images of Letters Patent may be available. Prior to 1930, records of land settlement in Alberta were handled by the Dominion Lands Branch of the Federal Government. Control of natural resources was transferred to the province in 1930 and all active land files were turned over. Documents in these files may date from early 1900s to late 1950s. These records exist only on microfilm at the PAA. As with the 1870-1930 homestead index the post-1930 index, which is included in the unified homestead index, is an all-name index to the homestead files. Many of the names appearing in the 1870-1930 records will also appear in this index as homesteaders who sought to acquire more land for farming, grazing and other entrepreneurial enterprises. With the above information, AGS Communications would like to emphasize that the AGS Alberta Homestead Index is superior to other homestead indexes for Alberta on the Internet. We invite researchers to use the free AGS Alberta Homestead Index and test the quality of indexing themselves. Acknowledgments: Norma Wolowyk, AGS Research Services Committee Chair for the body text; Lyn Meehan, AGS Communications for the Introduction, Conclusion, imaging and layout; and Wayne Shepheard, editing.